Imperial forces advance on the enemy after defeating a Tau attacking force at Sandeep Plains. “Do you think we learn nothing from our battles? With every fight, we learn more about the xeno’s weapons–and their tactics. This time, we knew what to expect, and every time they tried one of their xeno tricks, we were ready. We parried every attack. They died in droves.“–Major Azrael Gann, 18th Dar Sai PDF, commander of Imperial defenses at Sandeep Plains. A Tau attack against the Sandeep Plains was repulsed yesterday, with Imperial forces virtually annihilating xeno forces and sending the enemy reeling in defeat. 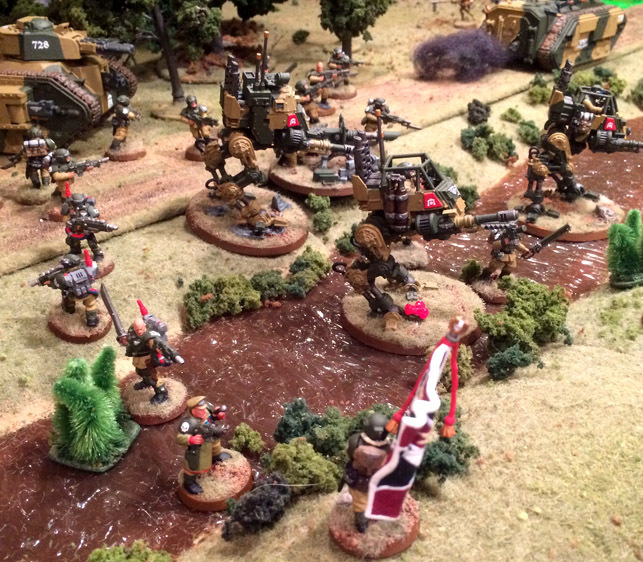 The Sandeep Plains are the linchpin of the Imperial defenses to the east of the Tau incursion. Although the military forces involved were small compared to previous battles involving Tau and Imperial troops, the Imperial victory was welcome news coming only weeks after the loss of Malati to xeno forces. Military authorities say the xeno attack appeared to be a probe to test Imperial defenses along the eastern perimeter of the Tau incursion zone, which now includes the Hanui Valley, parts of the western forests, and the newly fallen port of Malati. The xeno attacking force is believed to have consisted of no more than 1,000 xeno warriors, who a week ago began crossing the arid plains that constitute the central region of Dar Sai’s main continent. Spearheaded by Piranha skimmers that provided reconnaissance, the Tau approached the town of Sandeep Center, the regional capital, on the evening of 3 006 736.M41. Alerted to the xeno advance by orbital surveillance satellites, the Tau were met by a recently deployed battalion of the 18th Dar Sai PDF, under the command of Major Azrael Gann. 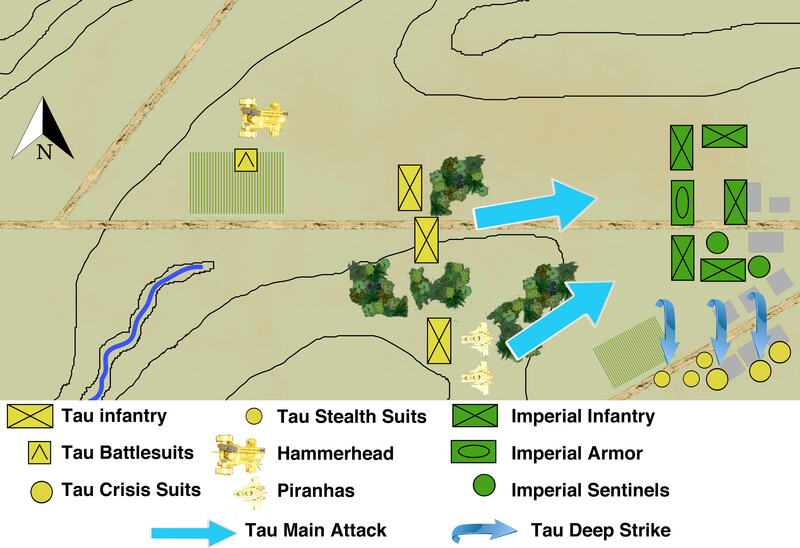 According to military sources, Gann had studied military briefings on recent Imperial-Tau battles and was aware the Tau favored tactics of mobile warfare. Most notable, it’s said, Gann noted that most Tau attacks began with a rapid advance of xeno skimmers equipped with homing beacons, which would then guide an aerial assault of Tau battle suits to a weak point in the Imperial line. To disrupt such an attack, Gann reportedly centered his defense on a platoon of Lemon Russ tanks on loan from the 728th Cadian Regiment. Around the vehicles, Gann deployed his troops in a concentric ring that left the Tau with no safe landing zone behind his armored base. What’s more, the circle of troops meant that any descending battle suits would come under immediate fire from several directions. To further discourage a xeno landing, anti-drop defenses–from snagwire to sharpened stakes rising out of the ground–were hastily constructed. As the Tau main attack attempted to Deep Strike amidst the Imperial lines, Tau and Kroot infantry assaulted the Imperial front line. They were mowed down by sustained and disciplined volley fire. On 3 007 736.M41, the Tau attacked exactly as Gann anticipated. 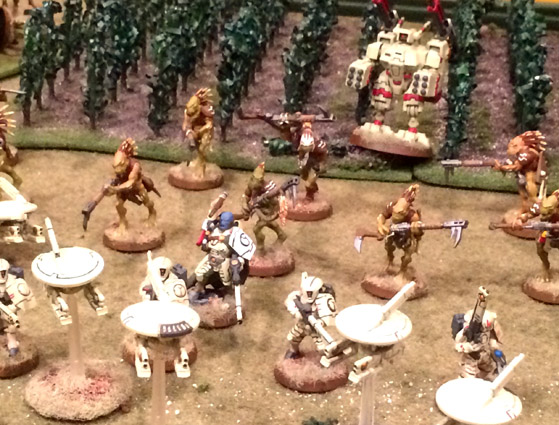 In the early hours of the day, Tau skimmers moved forward under cover of darkness and through crops and woods that screened the Imperial left flank. As dawn arrived, the skimmers broke from cover and charged the Imperial line, just as xeno aircraft roared past overhead, dropping dozens of xeno battle suits [Imperial code names: Stealth and Crisis Suits]. At the same time, Tau and Kroot infantry charged the center of the Imperial line. “If those armored suits had been free to land behind our lines–just as the xeno skimmers and infantry attacked our front–we would have been caught in a crossfire that would have devastated our defenses,” said one military officer, who did not wish to be identified. As the Stealth and Crisis Suits descended, however, the xenos apparently recognized that a landing inside the Imperial defenses was not feasible. Less than 1,000 meters from the ground, the descending xenos were seen to fire their maneuver jets and shift their downward trajectory to the south and amidst the undefended shacks and shanties that bordered the Imperial left flank. As one officer explained, landing among the shanties left the xeno elite troops with no clear line of fire as they landed and denied them the “shock value” of an aerial assault. What’s more, the time needed for the xenos battle suits to regroup gave the PDF an opportunity to focus fire on the attack of xeno skimmers and infantry on the front line, which undoubtedly had expected Imperial fire to be disrupted by the Deep Strike into the Imperial lines. With all Imperial troops allowed to focus their fire on one threat at a time, however, the xeno skimmers and infantry were quickly shot down. 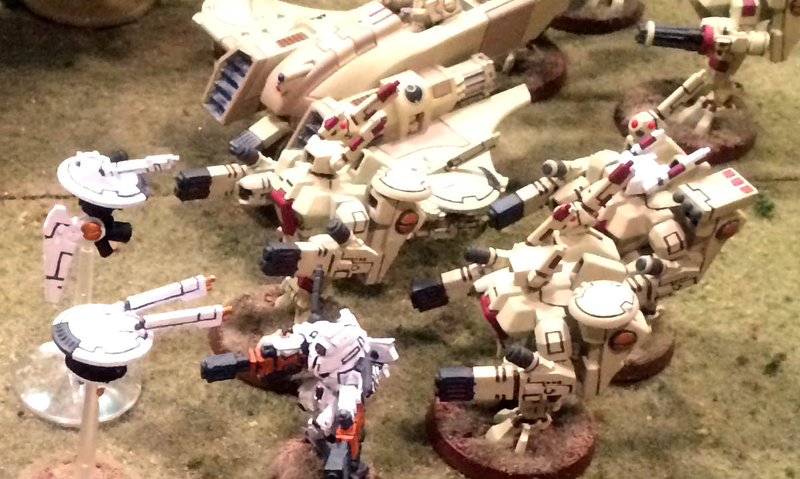 The Tau rely on a highly mobile plan of attack, utilizing skimmers, armored battle suits, and drones. This highly success tactic failed at Sandeep, however, as the Imperial deployment anticipated every move the Tau made. When the xeno battle suits finally broke out of the shantytown, Imperial forces were ready for them. One Crisis Suit leaped over a shanty and mowed down an entire squad with twin-linked burst cannon. But it was met by half a dozen flamers and a veteran squad armed with shotguns, and the xeno was brought down. Several Stealth Suits were cut down by controlled volleys of lasgun fire, and another Crisis Suit exploded after a direct hit from a lascannon. Under a torrent of fire, the xeno warriors undoubtedly felt great stress as they charged the Imperial line, which may explain the abysmal accuracy of their subsequent fire. Usually cursed for their accurate targeting systems, the Tau Crisis Suits killed only three score of PDF solders before the xeno advance was halted. Only one Crisis Suit–apparently the Tau commander–managed to break through the Imperial lines and fire a fusion blaster at the weaker armor at the rear of the Lemon Russ tanks. The Emperor’s favor was with Imperial forces, however, and the xeno’s plasma beam bounced harmless off the consecrated armor. Once the xeno battle suits were destroyed, the xeno’s attack was fatally compromised. Hundreds of Tau and Kroot auxiliary warriors were killed as they attempted to overwhelm the Imperial front lines in a second suicidal frontal assault, and an Imperial counterattack launched against the shattered xeno forces quickly turned into a xeno slaughter. By all estimates, less than 200 xenos survived the six-day retreat to their base of operations, harassed all the way by Imperial artillery, strafing runs by Imperial Navy aircraft, and a platoon of Sentinels that only turned back when they encountered xeno reinforcements from the Hanui Valley that counterattacked to cover the xeno retreat. Imperial Victory Points: 1 territory objective (3 v.p. ), Slay the Warlord (1 v.p. ), First Blood (1 v.p.) = 5 v.p. TheGM: The overwhelming dominance of the Tau in the defeat at Malati caused me great concern, as I was afraid the unit selection for the Imperial Guard was somehow flawed. So I decided to refight the battle as a solo game–and the Tau won again. So I fought two more solo games, creating new scenarios using the 40K rulebook. Again, the Tau won handily. I tweaked the Imperial order of battle (OB) and decided to play a solo game for keeps–in other words, the results of this fight would be included in the campaign. For the Imperium, I tried something different: Instead of a linear defense, I would set up a circular defensive line–centered on a Lemon Russ tank surrounded by troops in a tight defensive ring. That would leave no safe landing zone behind my tank for a Deep Strike by fusion-blaster-equipped battle suits. In the end, the new deployment and OB worked. The Tau battle suits could not land behind my tank, and I was able to bring a horrifying concentration of firepower upon the suits. Although one suit managed to clear a path and get behind my Lemon Russ, it missed–and it never got a second chance. It could be argued that this was an unfair battle, as I basically refought the Tau time and time again to seek a game plan to victory. But after four straight losses, I think the final fight still could have gone either way. Indeed, there was no point in fighting an official campaign game until I thought there was a chance for a competitive fight.